Visual Studio Code>Programming Languages>.NET Auto AttachNew to Visual Studio Code? Get it now. Automatically attach the debugger to a dotnet process started with dotnet-watch. Enables a seamless debugging experience when working with dotnet-watch. The ".NET Auto Attach" extension is created to enable a seamless debugging experience when working with dotnet-watch. While dotnet-watch will rebuild and launch your application every time you change and store a file, you have to manually restart the debugger each time. This is where ".NET Auto Attach" comes in and shines. After dotnet-watch restarts your application, it will attach the debugger to enable a seamless debugging experience while changing files on the fly. The extension supports solutions and workspaces with multi projects by letting you chose which project the auto-attacher should target. The extension notices when a project is no longer debugged and offers to re-attache if desired. C# - C# for Visual Studio Code (powered by OmniSharp). When your ".NET: Auto Attach Debug (dotnet-watch)" launch config is set up, you can debug your project. 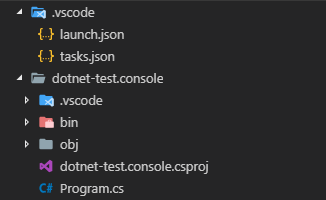 Pick the launch config from the dropdown on the Debug pane in Code. Press the play button or F5 to start. The extension currently operates in only one mode - it can launch your project you want to debug with dotnet-watch. Just like when using the normal C# debugger, you configure the mode with a .vscode/launch.json file in the root directory of your project. You can create this file manually, or Code will create one for you if you try to run your project and it doesn't exist yet. The extension will normaly ask you which project should get launched when your workspace contains multiple projects. However, you can pre-set which project should get launched. See the CHANGELOG.md for the details of changes for each version and known issues. typescript-collections - It is a complete, fully tested data structure library written in TypeScript. See also the list of contributors who participated in this project. Or the list of members.